Outstanding integrated amp. Conseravatively rated at 100 wpc. Great build and aesthetics. Full, rich sound (tube preamp) without a touch of shrill notes. I thought it was cleaner sound than Rotel and NAD products at this level. Italian made and the beauty (including a solid wood remote) show the outstanding build quality. 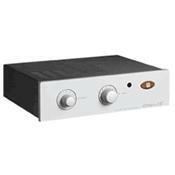 See http://www.tech.co.uk/home-entertainment/hi-fi-and-audio/hi-fi-amps-and-receivers/review/unison-unico-secondo for a fuller review. After rolling tubes through it and settling on Telefunken 12ax7s, The soundstage on this monster widened and deepened. The balanced inputs are HUGE to the sound and the imporved transformer offers a more powerful and quieter alternative to the Unico (which I owned previously) and Uniso SE offerings. The wood remote is classy and just feels good in your hand. Con: they could have made a cage on the top for rolling tubes so that you wouldn't have to take the whole top of the cabinet off. Pros amazing air and detail. Excels at Vocals, but drove my speakers so well I often was asked where the sub was located . . .
Amazing power and sound quality. Absolutely brilliant sound.